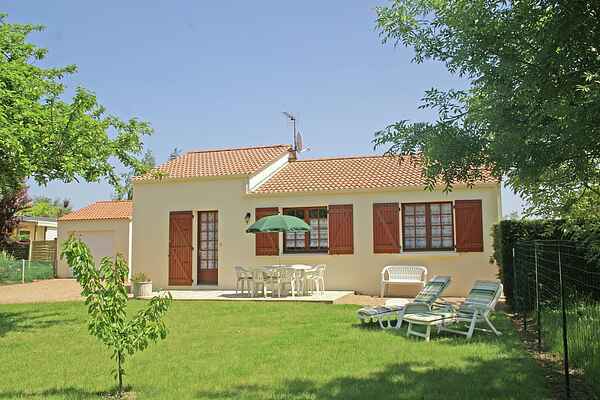 Discover this detached holiday home, only 200 m away from the cozy village square of St. Hilaire-la-Forêt. The house has bright rooms with a smart and well-kept interior. Behind the house you'll find a really nice garden where you can spend many enjoyable hours. Start a new book on your terrace, or doze off on your sun lounger on the lawn. After a day of sightseeing in the surrounding area, the barbecue will ensure a culinary ending to your day. In short, this house is a great place to call home! St. Hilaire-la-Forêt is very suitable for everyday groceries, or for a friendly chat in the village pub. The stretched sandy beaches and the beautiful forests of Longville (6 trails!) can be found 5km away. At a distance of only 5 km from the sea, your holiday home is the perfect starting point for many cycling and hiking trips. Such as towards Le Bernard, where a 18 kms track is laid out and where you can find numerous dolmens and menhirs. Further recommendations: Chateau Talmont (9 km), the Automobile Museum (17 km), La Guignardière castle and the menhir in Avrillé (3 km). And of course the famous beach resort of Les Sables d'Olonne (22 km), with its long sandy beach, swimming pool and lots of entertainment.